The 2017 fall semester recently kicked off with festivities at the Margaret H. Rollins School of Nursing at Beebe Healthcare with a welcome and orientation for first-year students. The Class of 2019 consists of 33 students from across the region. During orientation the students got a chance to meet faculty members as well as senior students from the Class of 2018. After completing the first month of class work and laboratory experiences, the students are now immersed in clinical rotations at the hospital and in long-term care. The School of Nursing curriculum consists of more than 1,000 hours of clinical experience. Therefore, students begin hands-on patient care within the first two months of school. The Margaret H. Rollins School of Nursing prides itself on a very rigorous curriculum which prepares graduates for the challenges nurses face in healthcare today. 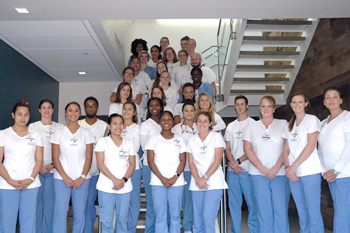 The school continually produces successful nurses and maintains one of the highest NCLEX pass rates in the State of Delaware. The Class of 2017 had a 94.1 percent NCLEX pass rate for all first-time test takers. The faculty, staff, and hospital are all excited to begin this new academic year and to welcome these nursing students to Beebe Healthcare. Shown (left to right) in front are Pamela Cruz, Kimberly Willette, Alexis Gale, Amir Johnson, Mae Salvador, Kirah Harmon, Olivia Goldschmidt, Clay Bowden, Jennifer Lang, Logan Galbreath, and Diana Bruce. In the first row are Maria Byrd, Kayla Duffie, Keshia Selva, and Mallory Drew; second row are Alexandra Campbell, Brandi Adkins, and Alexis Coverdale; third row are Emalie-Kiersten Anderson, Renee Adams, and Tierra Chandler; fourth row are Delmy Velasquez-Diaz, Julia Murphy, and Kevin McKinney; fifth row are Shelby West, Kelly Staples, and Angela Strong; back row are Jade Riley, Arlenys Torres-Rivera, Angela Baker, Katherine Cessna, and Mykala Steele. Missing from the picture is Kylie Lilly.